Before we go to an amazing show at the Rama Entertainment Center, My husband and I really like to make sure that we get in a few delicious drinks and an amazing meal. We are NEVER disappointed when we visit the Rama Resort. Never. Not even a tiny little bit. We went to Rama last month to go see STYX at the entertainment center and as usual, we were NOT disappointed. The show was amazing, OF COURSE, but the food before it made our night that much better. We went to the Rama Resort on the Friday before the Saturday show, we went out for a lovely dinner at St. Germain’s. (Which, by the way, was amazingly delicious.) After we ate, we went to the Casino and played a few slots. We aren’t intense gamblers or anything, but I like to take $20 and at least give it a little shot. After a few drinks, a walk around the Resort grounds and some amazing interactions with some fun random people, we decided we were ready for a snack and some live music. Off to the Simcoe Yard House we went to grab drinks and some wings. The live music was amazing, the person playing even did a tribute to Gord Downie! We had an amazing time. Either way, the service was impeccable both nights we decided to go that weekend. We had two different servers on one night, one was named Jennifer. Which by the way is my name. We had a bond. I wasn’t sure if it was her frozen-esque side braid or the same name, but we hit it off right away. The service, as usual, was fantastic the first night. I couldn’t help but feel at home! It was a great experience. There was live music being played, and it’s just such a comfortable, relaxing and friendly environment. In fact The Simcoe Yard House has LIVE ENTERTAINMENT on Friday & Saturday from 10pm to 1:45am. The next night, before we attended the STYX concert we made sure to visit the Yard House again! (Make sure you make reservations on a concert night, the line up was so long it was crazy, thankfully we thought ahead.) Guess what!? The wonderful lady with the same name as mine, from the night before was working and she was our waitress! We decided we wanted to try something new for dinner as we have been here several times before and wanted to step outside our comfort zones. 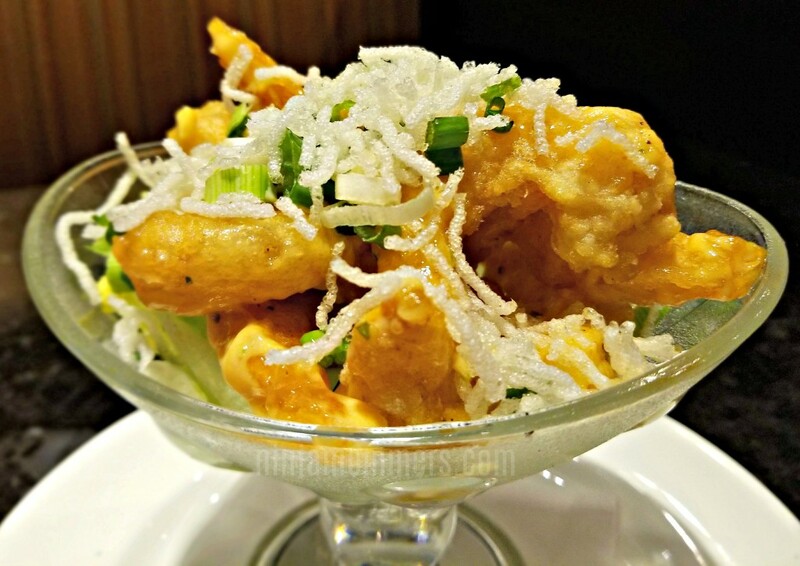 We started with the Firecracker Tempura Shrimp and I am so darn glad we did. They are tossed in a Honey Sriracha Aioli that had me wanting to lick the bowl, (but that would not have been very classy of me so I refrained.) The garnish of the Fried Vermicelli and Green onions was a really nice touch. Husband and I were super impressed with these and have been craving them ever since. Once we had polished off our appetizer, we ordered dinner. I am a huge fan of Fish and Chips but they have to be just right. I am SUPER picky about the way I like my Fish and Chips to be honest but the waitress (the one that I am pretty sure is my new best friend) assured me that they were steller. SO, I went ahead and ordered the Beer Battered Fish and Chips. They did NOT disappoint. In fact, WOW! They were some of the BEST Fish and Chips I have had in a while. 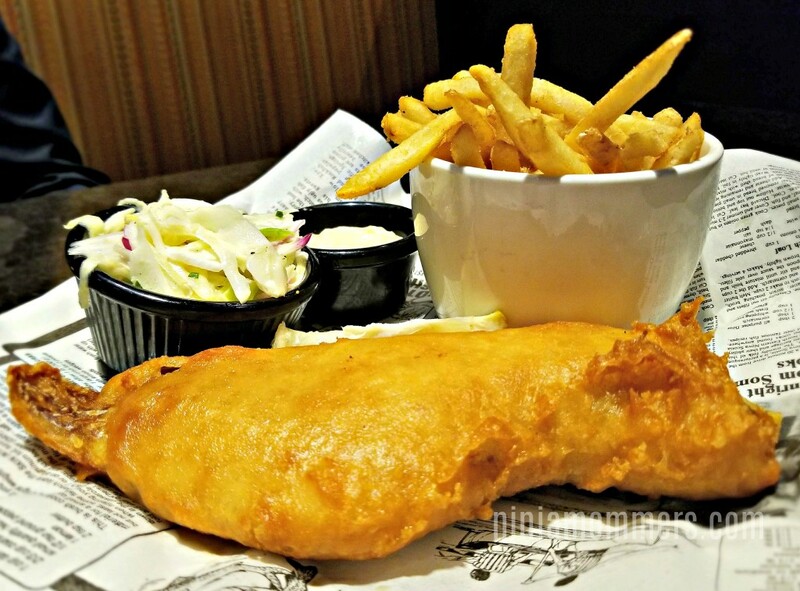 The fish is a Beer Battered Haddock Fillet and it served with Tartar Sauce, Coleslaw and Fries. YUM! It was the perfect dinner and REALLY hit the spot. The Beer Batter wasn’t thick and gummy like some are (I hate that), it was light and crispy. The fish was delicious and it wasn’t overly greasy. The fries we fresh and super yummy. All in all… DELICIOUS and I loved that they served it on Newspaper! My Husband went way out of his comfort zone and ordered a Burger. Can I tell you something? This is RARE. He DOESN’T like many burgers when he eats out. You see, he is somewhat of a burger buff. In fact, we have our own meat grinder and make our own burgers at home, so for him to decide to go for a burger at a restaurant is SCARY to me. I think I held my breath until he took the first bite. 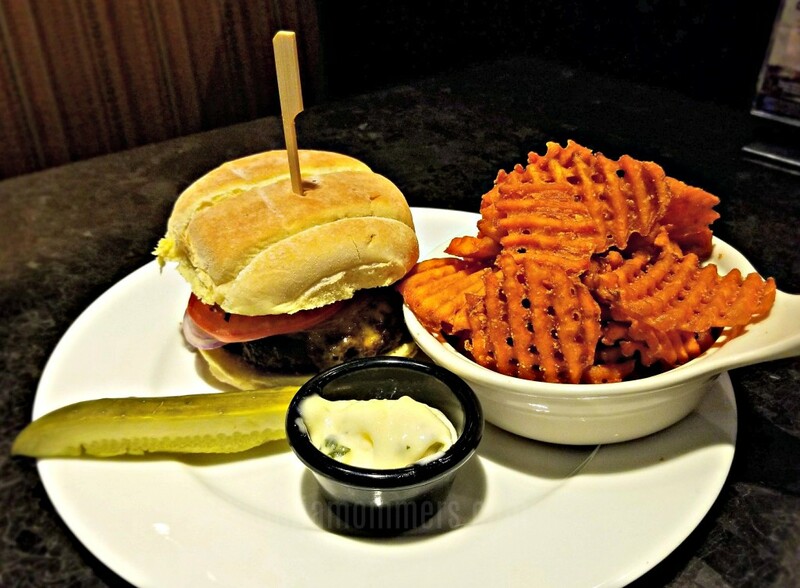 Husband ordered the Fresh Ground 8 oz Prime Rib Burger with Sweet Potato Waffle fries that came with a Lemon and Garlic Aioli. When he took the first bite he looked up to catch my gaze and nodded his approval. I am pretty sure that in that moment I screamed: “REALLY! ?” and scared some of the patrons. He made sure at that moment to reassure me that yes, this was good. He was really impressed. THAT is totally saying something because I AM TELLING YOU he isn’t impressed by much in terms of burgers, unless he makes them himself. The burger came topped with Boston Lettuce, Tomato, Onion, Cheese and Bacon and he polished that bad boy off pretty quickly. Husband was also pleasantly surprised by the Sweet Potato Waffle fries and the Lemon and Garlic Aioli, and gobbled those up too. Now I am going to be frank with you. I am not usually one to skip dessert because well… It’s my fave but husband and I were SO FULL because the portions were so great that we just didn’t have room. I remember thinking a few times while I was eating that I should maybe not eat it all so that I could indulge in dessert but I also distinctly remember not wanting to stop eating the food because it was just too good. Next time dessert, Next time! So if you are ever traveling around Canada and want a delicious meal, an excellent place to stay and an amazing concert/show venue, Casino Rama Resort has it all. There are a variety of amazing restaurants, an amazing entertainment centre, a fantastic and relaxing spa, and comfortable and luxurious rooms! Just make sure to make reservations for dinner, because you aren’t going to want to wait to eat this delicious food at the Simcoe Yard House. The food looks so good! I love when a venue has everything under one roof. Great for date night! I have heard so many great things about the Casino Rama Resort and that food all looks amazing. If I am ever up that way, will definitely be checking out this resort. What a fun spot for date night! 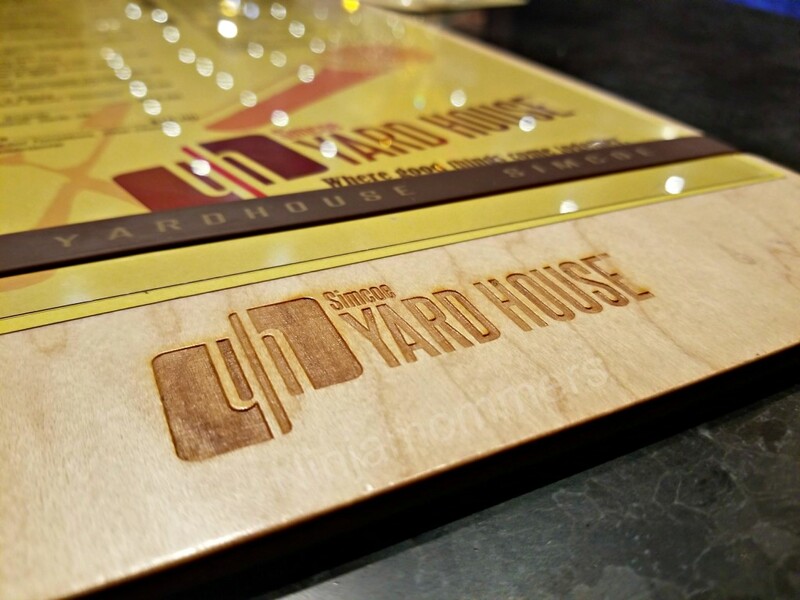 I love the Yard House, it is one place we love to frequent on vacation.